Beat those colds! Stop feeling tired and take control of your health. 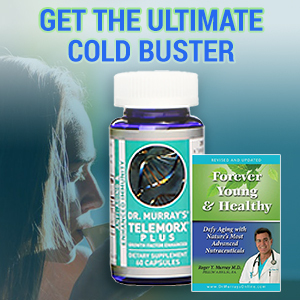 Our Ultimate Cold Buster Special with Telemorx Plus can help improve your vitality and sense of well-being and Dr. Murray's book, Forever Young & Healthy will educate you about the science behind his Telemorx line of supplements and how they can help you. Telemorx® Plus is made from liquid bovine colostrum that has been diverted through special filters and this is then added to our regular Telemorx® to become Telemorx® Plus. 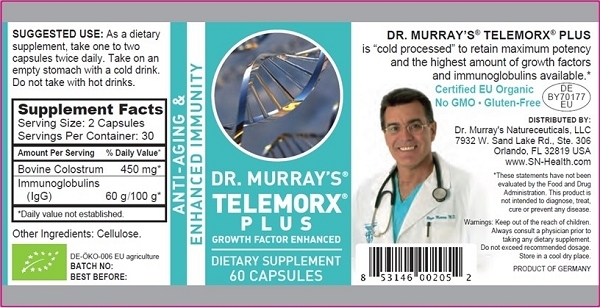 The Telemorx® line of supplements were designed by Dr. Murray as enhanced anti-aging products. Telemorx® supplements are made from cold processed and ultra-filtrated bovine colostrum that is derived only from certified organic cows. Colostrum is a fluid that is only present during the first 48 hours of feeding. Colostrum contains disease-fighting essential proteins, carbohydrates, fats, vitamins, and minerals that are essential immune system building blocks. Telemorx® Plus is using our patented refrigerated process which enables it to retain the highest bio-availability since we don't pasteurize or spray-dry during processing. Click here to learn about our patented process. In his book, "Forever Young and Healthy", Dr. Murray discusses the Growth Hormone (IGF-1), Immunity, the Intestines and his product, Telemorx. He explains the science behind IGF-1, beating a flu pandemic, how to solve intestinal problems and how Telemorx can help you. Works great! My wife and I are taking this supplement. Thanks ! I am a 62 year old runner who enjoy running 3 to 5 miles a day. Life, or time, caught up with me and I found myself unable to recover but every 3 days. Last month, I ran 5 miles every day with amazing recovery! The quality of my life is now where it used to be years ago. Thank you, Dr. Murray! 16 points will be rewarded to you when you buy this item. Sign into your account to view or redeem your points. When you're signed in, you'll be able to redeem your points on eligible products!